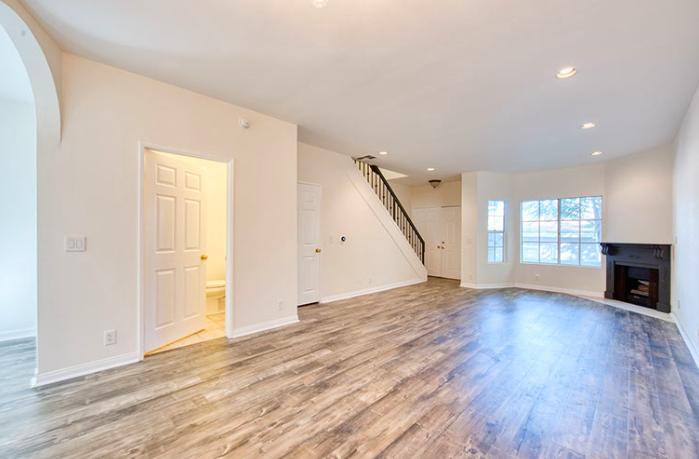 Welcome home to this newly renovated, 3-level townhome in the heart of North Hollywood! Step inside and enjoy the high ceilings and open floorpan, with new laminate floors, designer dining pendant, and nicely appointed powder room. The fully renovated, eat-in kitchen, with pantry and stainless appliances is perfect for the gourmet enthusiast. Head upstairs to the master bedroom, with his and hers walk-in closets, private balcony, and ensuite bath. The guest bedroom is also overly spacious, with large ensuite bath and tons of natural light. The unit also boasts a sizable bonus room, perfect for an office or gym with brand new washer/dryer. The piece de resistance is the oversized 2-car private garage with direct access to the unit and provides plenty of additional storage space. Upgrades include brand new HVAC system with Nest thermostat. Conveniently located near the NOHO Arts District, 3 major freeways, Universal and Disney Studios, the Metro redline, and the Bob Hope Airport!